If you remember, I’ve been working with Jutta Vollmer at Kölner Graphikwerkstatt. I have come with a second idea in mind. We will draw on both sides of a piece of paper and manipulate, fold or cut the paper to create a very simple 3D form. The aim is to create an exterior plane and an interior plane or surface. After an hour or two we acknowledge our lack of progress. The work we produce feels too foreign and leaves us both cold, although I am conscious of being intrigued intellectually. This interest isn’t showing in the work though so we abandon the idea. We move onto our third project. 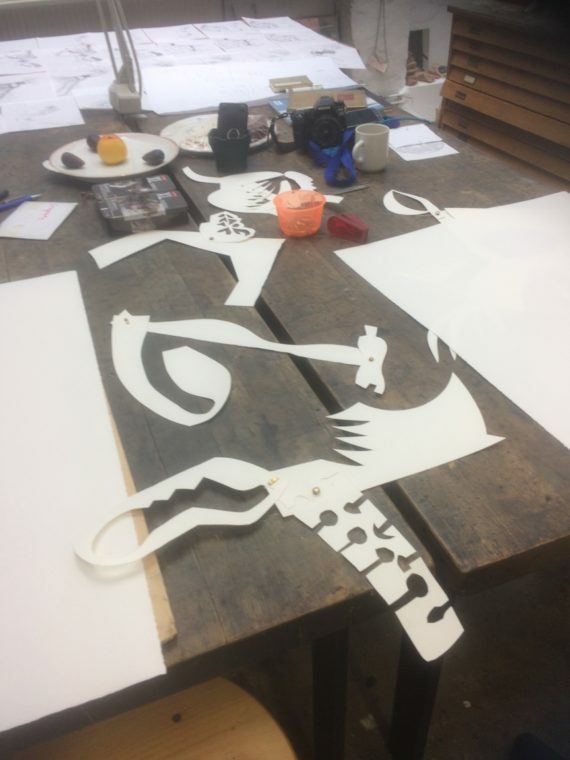 We will create large drawings, working alternately, but to bypass the difficult first mark we improvise cut outs, connecting them using brass butterfly clips to make paper puppets. Then we animate the shape-puppets until we they spark a response. The change in scale prompts grander mark-making from myself, or perhaps this is a reaction towards the lack of structure in the layout pad drawings. We don’t erase one another’s marks but we obliterate them with less compunction than before. 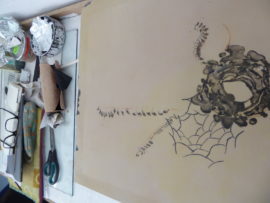 We draw solidly for hours passing the drawings back and forth. Time and again I observe real tension in the drawings. Jutta’s inclination is to build detail into mass covering a small area. She is very steady. By contrast, I make more and more risky marks until I’ve pleated one drawing and poured gouache down another. Two days pass and we look back on the work we’ve made. We’re both wrung out but buzzing. Of the 76 drawings we have made together only very few have ‘worked’ but I’ve learnt something from each one. There follows time out to visit Köln’s museums or sit and think. The museums are expensive but fantastic. The new Pas de Deux display at Kolumba overwhelms me completely. I take a whole day to get around it. Art and Roman artefacts are arranged with care and purpose room by room. In Room 8, for example, there is a blood red painting (Joseph Marioni), a crude but beautiful wooden carving of Christ seated, three grave urns and a small black marble head. Without the guide, which is yet to be translated into English, I am thinking harder than I’ve done for a long while. This enhances the experience, perhaps predictably, and I experience a moment of epiphany ruminating on the content or possible meanings implied by this grouping. This time alone to digest the shared drawing, mull over my ‘moment’ in the Kolumba and reflect on my own practice is critical of course. 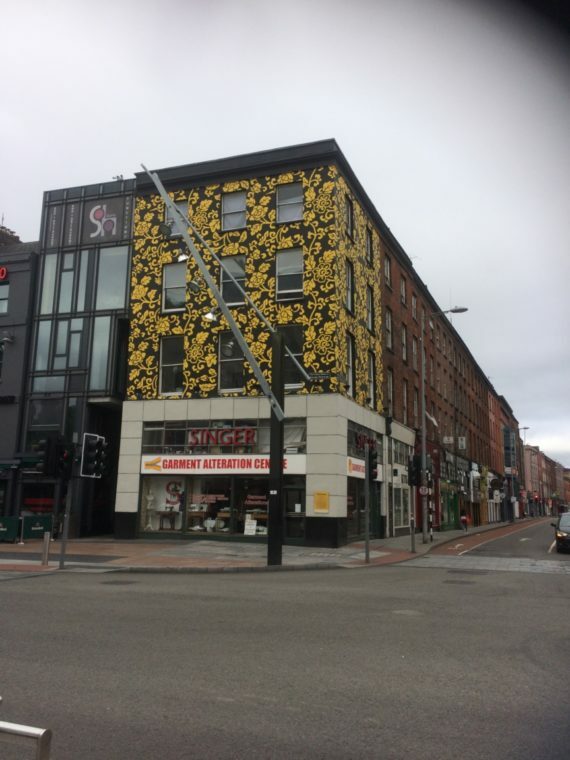 Why then is it so difficult to create room for it to happen closer to home? Just returned from a week of collaborative exploration in Köln. Kölner Graphikwerkstatt is the most conducive workshop I have ever worked in. 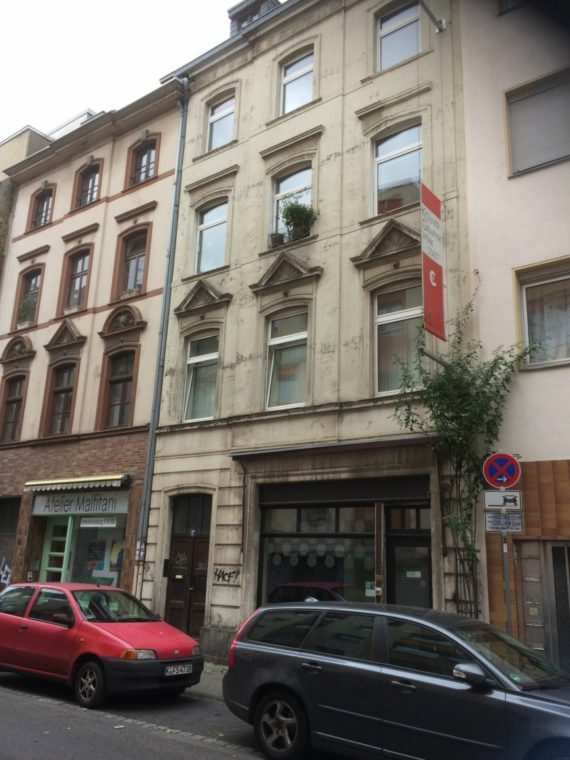 On the edge of the city centre, the building is old with three windows across the front and four storeys. As a result of the second world war this is unusual enough to be listed. 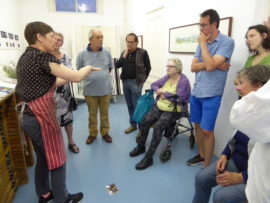 On the ground floor there is a gallery with a glassed shop front, behind which the space opens out into a squarish print studio with an enormous roof light, well-loved etching presses and a wall of kitchen. 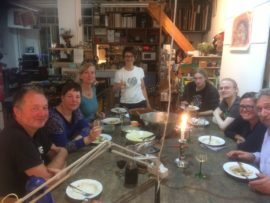 On my arrival, a meal is cooked communally and shared with regular studio users. They feel like a large relaxed family. Jutta Vollmer and I have the space to ourselves for the next week. Up until this point we haven’t worked collaboratively other than remotely (by post). I’ve chosen Jutta because of the PenPal project. In responding to the print I sent her she would focus on an element, tweak and expand upon it. 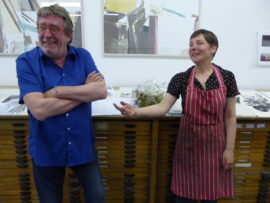 Neither of us produced work typical of our own practice and called it ‘a response’. Like a good conversation, she was listening to what I had to say. I never felt she ‘talked across me’ or came out with the thing she had planned to say regardless of its relevance. 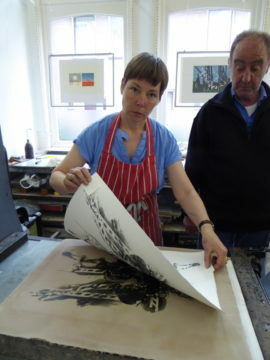 Before we start Jutta shows me a box of work, prints spanning a period of twelve months or more. 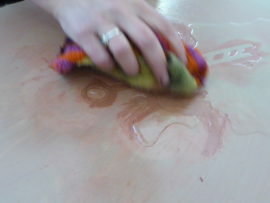 Her work has moved on from when we last worked together. 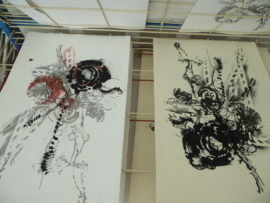 Our drawing styles are poles apart though we share an interest in the macro and abstraction. Jutta brings up the subject of possible outcomes: a book, exhibition, Instagram feed. I say I’m happy to have no outcome, just play and she laughs. Perhaps there will be outcomes years hence. The first project starts with two ‘layout pads’. 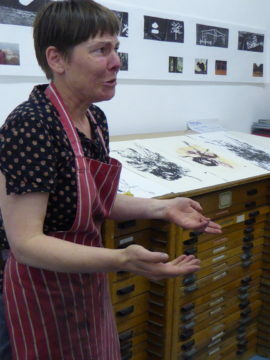 We will take turns to do a three-minute biro drawing in each pad before swapping. 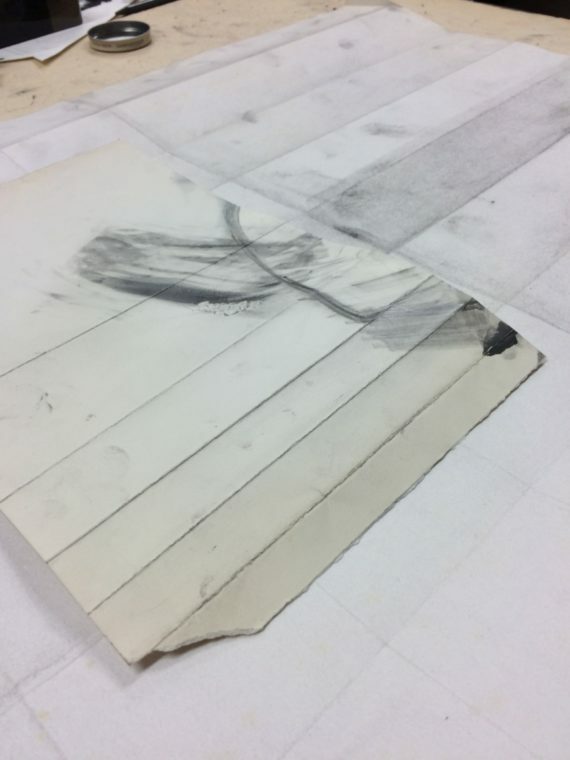 The first four pages of each pad is interleaved with carbon paper, which we will gradually move down the pad. After the first four pages during which the image is building, every sheet will comprise of four elements: two by myself and two by Jutta. The oldest part of the drawing drops out each time to be replaced by the newest. 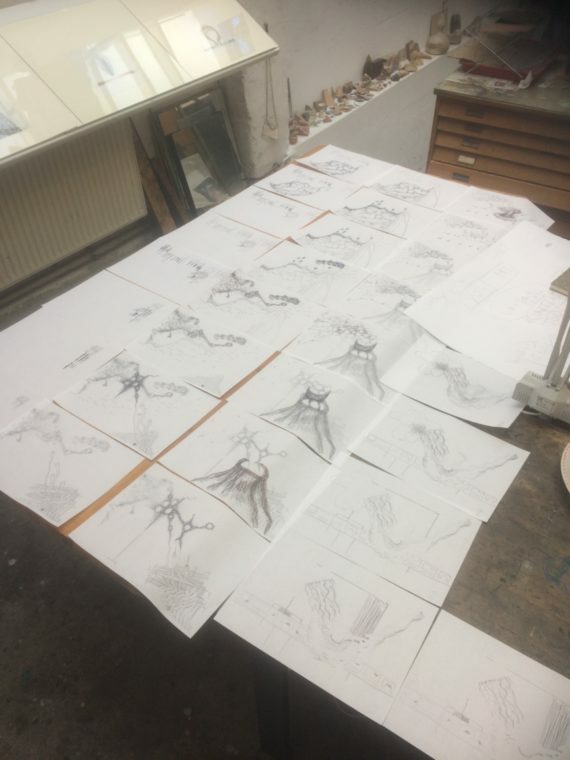 We draw until we have two books with thirty-three composite drawings in each, then we stop, lay out all the drawings and review the process. There is less cross-over between the drawings in the two books than you might expect. Neither of us feel ownership of either book. 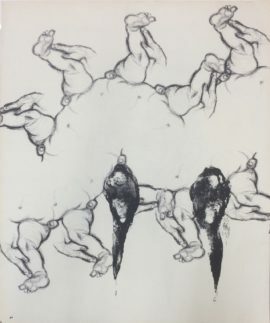 Mostly the individual drawings fail to gel and it’s interesting to discuss why. 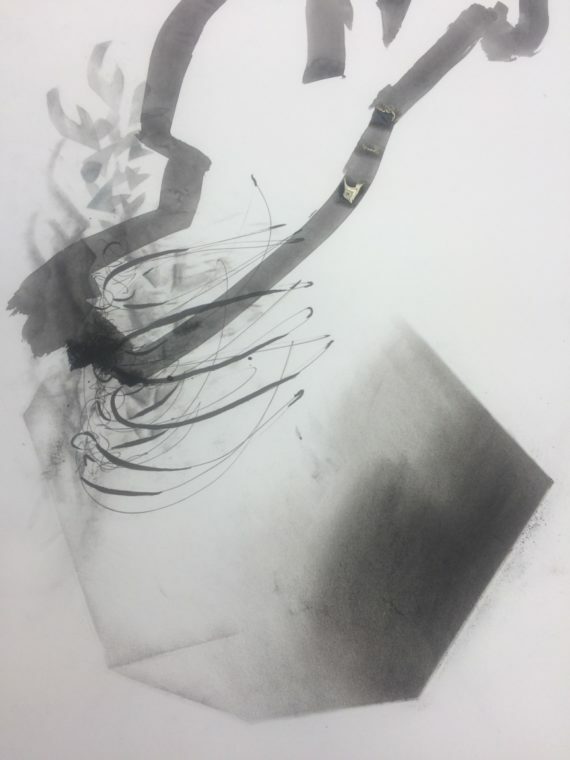 We recognise and acknowledge the point at which a drawing has fallen apart and had to be ‘rescued’. If there is one thing continually lacking it is structure. Perhaps it is the books are more important than the individual pages? We are building trust, using association and intuition. I feel we are working towards the point where we will be able to cancel one another’s marks although currently the limited carbon paper is doing it for us. 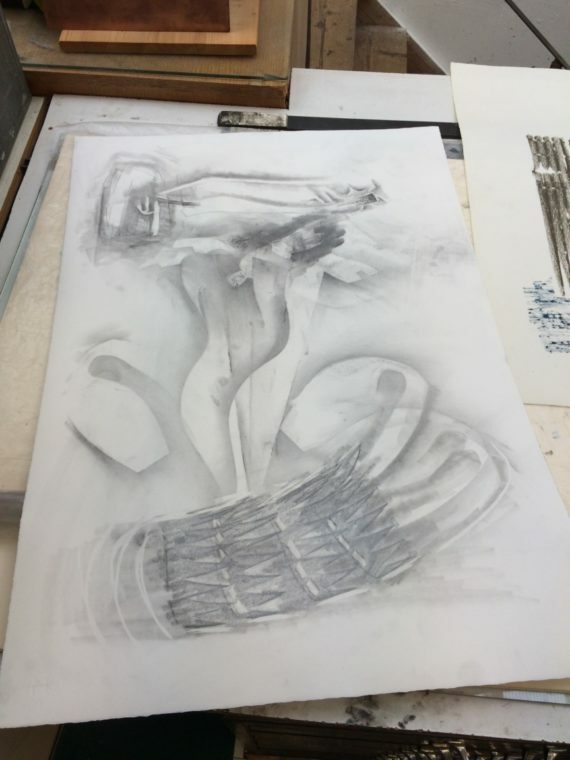 My previous collaborative drawing experiences – organised by Jon Barraclough and Mike Carney of the Drawing Paper – have been extremely time-limited which makes the week we will spend doing this all the more valuable. This book-based work takes a day. It’s only a warm up. Postscript At home I photograph these books page by page using my phone and animate them using iMovie just to see what they look like. They are on my Facebook page. 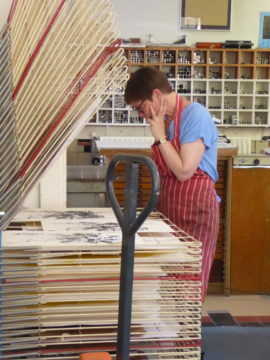 It wasn’t on my a-n project proposal, in fact it’s out of the blue, but the current editor of Printmaking Today, Leonie Bradley invites me to speak at Cork Printmakers‘ symposium about the periodical from a reader’s perspective. The symposium – First Edition – is an international event. 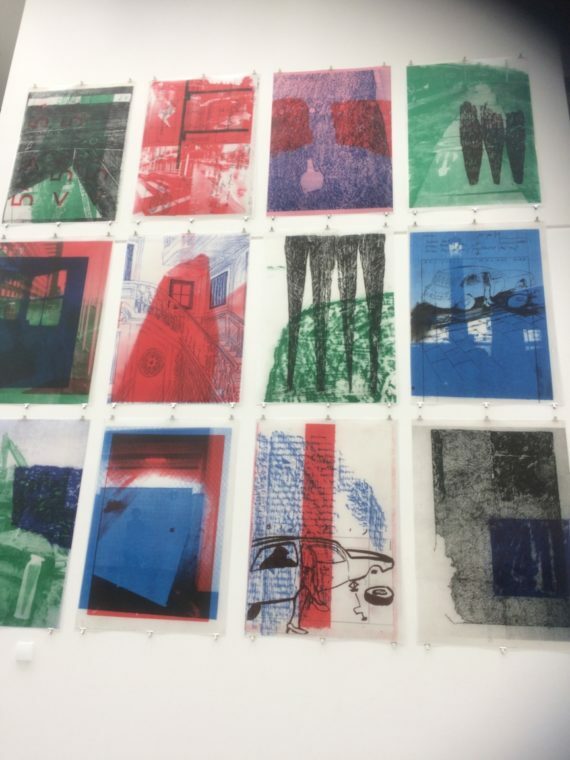 It will explore print on concrete, ceramic, glass; print incorporated into installations; print at the very forefront of contemporary visual arts practice. In addition to panel discussions on subjects such as ‘materiality’ and the concept of an ‘expanded practice’ there are eight exhibitions to visit. And I love Cork, having spent a term there on the ERASMUS exchange back in the 80’s. First Edition proves pivotal for me. I think it’s the sheer ambition of artists like Ton Martens (Over, Over & Over), Leslie Mutchler and Jason Urban (Babel Unbound). The speakers are inspirational too, and seem to know exactly what I need to hear about. I find myself sitting next to Carl Rowe, the Fine Art Course Leader at Norwich University of the Arts. I’ve recently reviewed Artist Boss – a book written by two of his colleagues, Jenny Dunseath and Dr Mark Wilsher. (Good book about Caro, workshop assistants, authorship, making – get it. The resources pages on the accompanying website also come recommended.) We discover this connection when I ask if he knows of anyone organising crits for artists post-MA. (A theme in my life at the moment.) It turns out Wilsher and his wife (Rosie) have recently published a succinct starting point for discussion groups. Better still, on the pamphlet it says ‘copy, distribute’. So here it is. 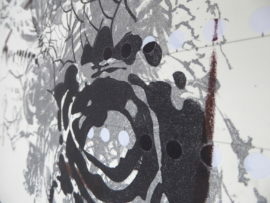 Dr Andrew Folan’s influence on contemporary printmaking is everywhere and he presents his own work for discussion. He’s usually found at NCAD Dublin. 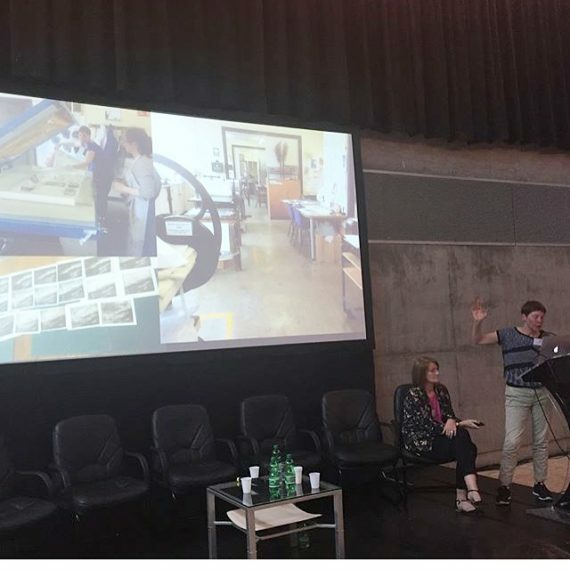 Magda Stawarska-Beavan (Research Associate, University of Central Lancashire) gives a talk on the last day about funding available from Creative Europe. Much to think about on the plane home. 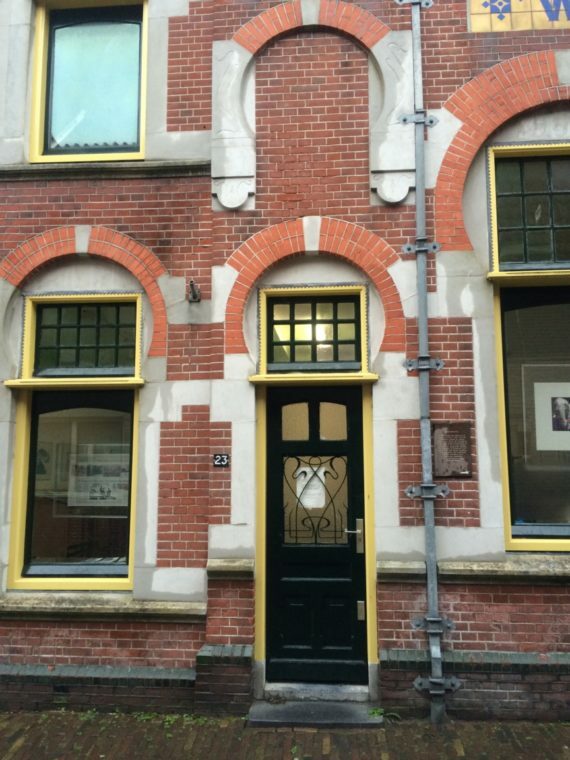 Back in May I spent a week at Grafische Atelier Alkmaar or GAA as it’s known. Alkmaar – roughly a 50 minute drive from Amsterdam – is an historic Dutch town famous for its cheese market. 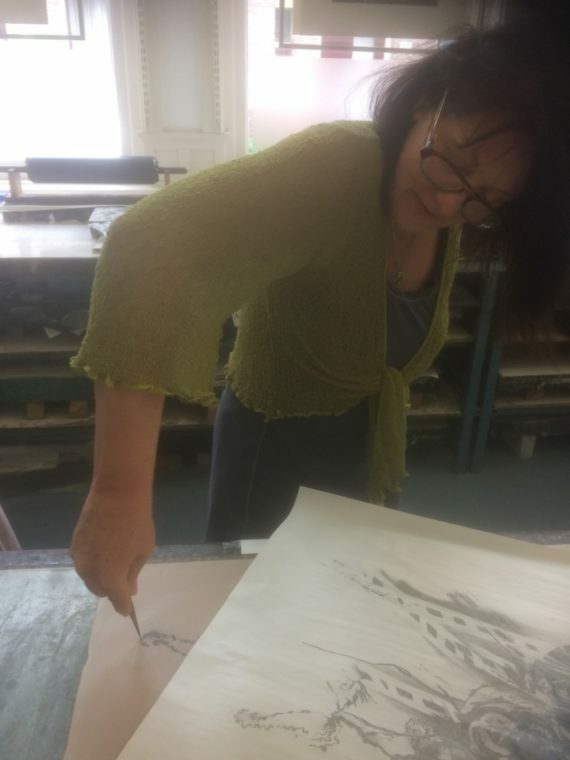 I went to make a lithograph with master printer Marja Vleugel and work alongside two of GAA’s founders, Jos van Amsterdam and Rolluf van Laar. 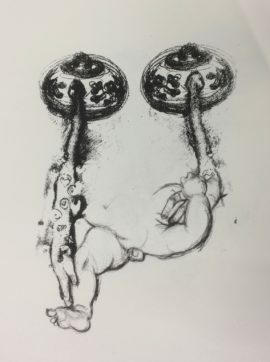 This was my second visit and a rare opportunity to draw on the Bavarian limestone slabs used to make lithographic prints. The greasy drawing materials feel unlike anything else to draw with, as does the surface of the stone itself, super sensitive. Dutch: the word I hear most often from Marja is ‘Nee’. ‘Nee nee…’ slowly with a gentle shake of the head meaning ‘don’t worry but that’s not the way’. ‘NEE!’ loudly with a sharp movement, meaning ‘keep the clean sponge out of the oil’. All her nee’s are nuanced. 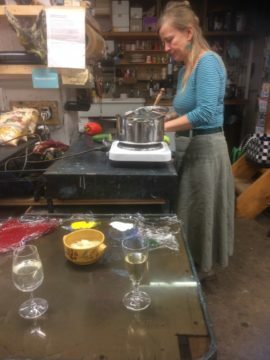 Here she is teaching me how to registered second and third colours using pins and two holes made with an etching tool in the actual stone. Infinitely patient. 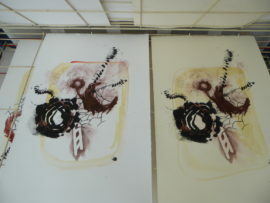 I make monoprints rather than an edition, with the aim of maximising this opportunity to learn. I layer them up watching the inks overlay. The inks are also a revelation: newly developed water-soluble oil based inks by Hawthorn. They are fantastic. There is a particularly wonderful graphite colour. 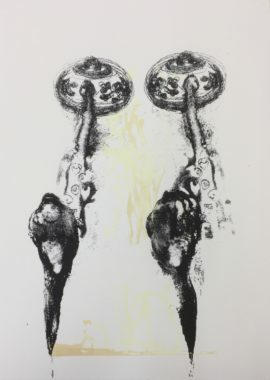 The prints themselves are experiments in mark making and technique. As works of art they lack content. I give a talk at the end of the week. 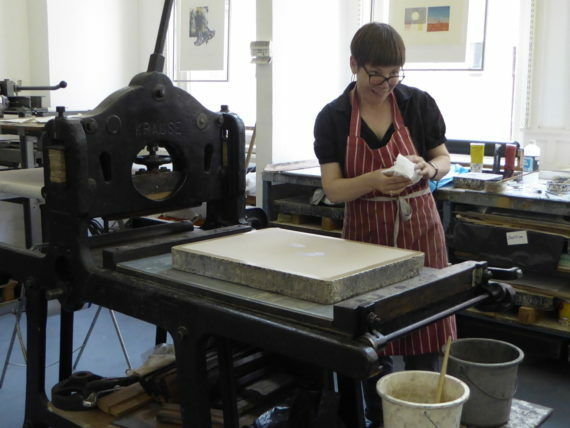 We publicise it through my blog, a paper invite, an (e)mailout and the Atelier’s website. 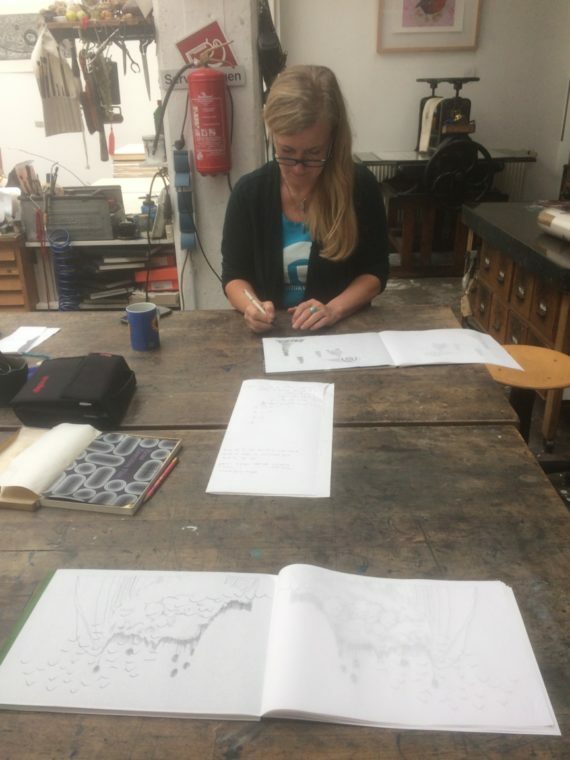 I talk about my working practice, artistic research, how I support myself, the two print workshops I rely on, the people I teach. I like giving talks and often learn something from the experience but this one is not good. I’m too tired to pick a clear path through all the information I could be giving, and I know the prints I’m showing are weak but I am sincere. The audience picks up on this and responds warmly. Before I leave, Marja and I talk about the possibility of a project linking technicians from Europe. 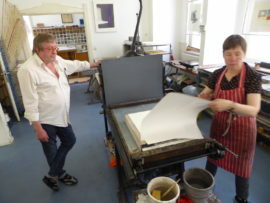 We also talk about exhibiting future work (mine) at GAA, the Atelier’s forthcoming return to the Gröte Kerk and the optimum timing of a Bath / Alkmaar exchange (this conversation is on behalf of Bath Artist Printmakers). I promise a room to anyone who wants to visit Bristol.